Imeson Field, also known as Jacksonville Imeson Airport, was the airport serving Jacksonville, Florida, from 1927 until its closing in 1968. 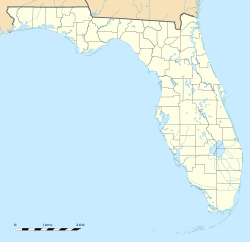 It was known as Jacksonville Municipal Airport prior to World War II, Jacksonville Army Airfield when the United States Army Air Forces controlled the facility during World War II, and at its closing the airport was Jacksonville - Thomas Cole Imeson Municipal Airport. Imeson Field was built southeast of the intersection of North Main Street (U.S. 17) and Busch Drive, the site of a 175-acre (71 ha) prison farm north of downtown Jacksonville. Originally it had a 2,100-foot cinder and shell runway, a 2,500-foot grass runway, an administration building and a hangar. By 1934 the Department of Commerce Airport Directory said Jacksonville Airport had four "sandy, sodded, surfaced" runways, all 2,500 feet long, with a row of hangars on the side of the airfield. The manager was listed as Major Herbert A. Maloney. Jacksonville Municipal Airport Number One opened on October 11, 1927. A dedication ceremony prior to the opening included Charles Lindbergh, who flew to Jacksonville in the "Spirit of St. Louis" to promote the new airport and Jacksonville's aviation industry. Aviation was still considered a novelty, but he assured city leaders that air passenger service would span the nation. Eastern Air Service (later known as Eastern Air Lines) was the first passenger airline at Jacksonville, beginning in 1931. By 1941 the airport had expanded to 600 acres (240 ha) adding five hangars, a terminal building and five asphalt runways, the longest being 7,000 feet (2,100 m). Airlines were Atlanta-based Delta Air Lines (1924–present), Miami-based Eastern Airlines (1926–1991), United Airlines, National Airlines (1934–1980, which at one time made Jacksonville its headquarters), Boston-based Northeast Airlines and Atlanta-based Southern Airways (1949–1979). The first scheduled jet flights were Northeast Convair 880s in April-May 1961. Originally named Jacksonville Municipal Airport Number One, in the 1950s the facility was renamed after Thomas Cole Imeson (1880–1948), city councilman and later longtime commissioner in charge of airports and highways. Imeson’s work led to the creation of Jacksonville Municipal Airport, as well as improvements to its runways, hangars and terminal buildings. This was the city's main airport for 42 years. Imeson died in March 1948 at age 68. As part of the buildup of forces prior to the United States entry into World War II, the Army Air Corps leased Imeson Field from the City of Jacksonville on 6 February 1941. Construction of military facilities at Jacksonville Army Airfield began on 5 April. It was assigned to I Bomber Command, First Air Force. A flight of the 16th Observation Squadron (Medium) was assigned with light observation aircraft with a mission of monitoring coastal airspace for Nazi U-Boats. Jurisdiction was transferred to Army Air Forces Antisubmarine Command which assigned the 7th Antisubmarine Squadron in December 1942. Antisubmarine aircraft operated with A-20 Havoc light bombers and B-18 Bolo medium bombers equipped with submarine detection equipment. The antisubmarine mission was turned over to the United States Navy in mid-1943, and Naval Auxiliary Air Station Jacksonville began to operate Consolidated PB4Y-1 (B-24D Liberator) long-range bombers from Jacksonville AAF equipped with antisubmarine equipment. The airfield was designated as Naval Auxiliary Air Station Jacksonville #1 by the Navy, however the base remained under Army Air Forces control. The improved PB4Y-2 long-range maritime patrol aircraft, designed by Consolidated specifically for Navy use began to arrive during the late summer of 1944. The base's maximum complement of 67 aircraft was reached in 1945. A contract was initiated with National Airlines in July 1942 by AAF Training Command for National to conduct aircraft mechanics training courses to AAF personnel. With the antisubmarine mission being taken over by the Navy, Jacksonville AAF became an aircraft servicing base for the Army, with the Navy performing the operational missions as a tenant organization. On 31 August 1943 USAAF Antisubmarine Command returned to the control of First Air Force and Jacksonville AAF was transferred to Third Air Force jurisdiction, and became a sub-base of MacDill Army Airfield. It was subsequently transferred to control of Chatham Army Airfield, Georgia. During 1944 and 1945 Air Service Command used Jacksonville AAF as a staging base for Station Compliment squadrons prior to their overseas deployment. On 1 July 1944, the host unit, the 4203d Army Air Forces Base Unit (Aircraft Service) was re-designated the 4203d AAFBU (Air Base) as part of the transfer to Service Command. With the end of the war in Europe in May 1945, the Navy antisubmarine patrol aircraft were withdrawn, and Army personnel began to be reduced at airfield. Plans were made to return the airfield to civil control after the Japanese surrender in August 1945. In the fall of 1945, jurisdiction of Jacksonville AAF was transferred to Air Technical Service Command (ATSC), whose mission was the transfer of any useful military equipment to other bases around the country. The base was closed and declared as surplus in 1946, being was turned over to the War Assets Administration (WAA) for disposal and return to civil use. The City of Jacksonville reopened it as Jacksonville Imeson Airport. The airport was named after Thomas Cole Imeson, a longtime city councilman whose visionary work led to the opening of the airport in the 1920s. Thomas Imeson died in 1948. In an era of multistop airline flights JAX was busier than people nowadays would expect. The April 1957 Official Airline Guide shows 75 weekday departures: 41 Eastern, 22 National, 9 Delta and 3 Southern. The largest airliner scheduled to Imeson was the McDonnell Douglas DC-8-61 flown by Delta Air Lines. Delta, Eastern Airlines, National Airlines, Northeast Airlines and United Airlines flew Boeing 707s, 720s, 727s, Convair 880s and McDonnell Douglas DC-8s and DC-9s, and Eastern and National flew Lockheed L-188 Electras to Imeson. With the appearance of jet airliners in 1959-60 the geography that precluded longer runways became a fatal liability. Jacksonville International Airport opened five miles to the north in 1967 with runways that could handle larger jet airliners; Imeson became a general aviation airport and closed in 1971. With the closure of the base by Technical Service Command, a small portion of Jacksonville Army Airfield was transferred to the jurisdiction of Fourteenth Air Force on 15 December 1946 for subsequent use by postwar reserve forces. It became a reserve Air National Guard base under Air Defense Command. The Florida Air National Guard's 159th Fighter Squadron began operations at Imeson Field on 9 February 1947 with an initial strength of 18 personnel and flying P-51 Mustangs. The unit was called to active duty on 10 October 1950 as a result of the outbreak of the Korean War. The unit was released from active duty on 9 July 1952; on 1 July 1956 the primary unit designation was changed to the 125th Fighter Interceptor Group. During the 1950s and 1960s the 125th FIG operated a variety of aircraft, including the F-80 Shooting Star, F-86 Sabre and F-102 Delta Dagger. In 1968, the 125 FIG relocated from Jacksonville Imeson Airport to a newly constructed military installation at the newly constructed Jacksonville International Airport. With the concurrent closure of Imeson Airport and its conversion to an industrial park, the 125 FIG vacated their facilities and turned them over to the City of Jacksonville. In 1970 Webb International Inc. purchased the former 1,500-acre (6.1 km2) airport and turned it into a new commerce center, Imeson International Industrial Park, with numerous buildings being constructed over the former runways. The southeastern portion of Runway 30 has been reused as Imeson Park Boulevard. Local pilot Laurie Yonge offered airplane rides from the beaches. Rates were $5 for short hops, $10 for long rides, and $25 for aerobatics. His transport pilot license was the first issued in Florida, and his National Aeronautics Association card was signed by Orville Wright. It was Yonge, flying in the Spirit of Jacksonville, who dropped an invitation from the air to the deck of a ship returning Charles Lindbergh and his Spirit of St. Louis. On May 20, 1929 Yonge set the world's light plane endurance record in a 90 hp. Curtiss Robin. He flew continuously for 25 hours and 10 minutes, a record that stood until 1939. No other aviator has brought such fame and success to Jacksonville as a visionary pioneer and instructor pilot. A hangar at the northeast end of Imeson near North Main Street displayed Laurie Yonge’s name until its demolition in the 1970s. Maurer, Maurer (ed.). Combat Squadrons of the Air Force: World War II. Maxwell Air Force Base, Alabama: Office of Air Force History, 1982 ISBN 0-405-12194-6. ^ The OAG was then published monthly by American Aviation Publications of Washington DC.